The government has announced the closure of the Swine Flu hotline so beloved of journalists and other layabouts. This comes less than two months after the Chief Medical Officer admitted that the Swine Flu outbreak may not have been quite as deadly as first feared. Figures indicate that 392 people have died from the mild flu, a figure slightly less than the 210 million September death-rate predicted for the small sea-side town of Formby alone. Medical experts from around the world are convening at an international conference to determine the best approach to future outbreaks and plan a co-ordinated response – as well as which manufacturer of a pointless vaccine will benefit from the next outbreak. Experts believe that some opportunities were missed with the recent outbreaks due to a lack of co-ordination regarding the branding of their products. Indeed it is effective branding that medical opinion is convinced will provide a more fertile breeding ground for medical papers, research grants and the all-important public service interviews on the GMTV sofa that will lead to greater royalty fees for their next books. 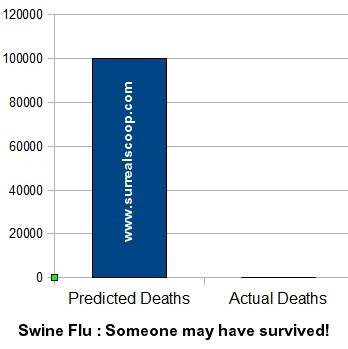 Whilst Swine Flu has claimed less deaths around the world than 'falling over' does in a month in an average care-home, medical experts insisted we must remain vigilant.